August | 2011 | Small Farmers. Big Change. Why not bring delicious food items that are good for YOU and good for those who produce them? To help us plan a tasty meal that will also help support small farmers, local economies, and co-operative businesses, Principle Six food co-operatives are creating these beautiful charts to remind us which of their products can make a summer picnic perfect for everyone. 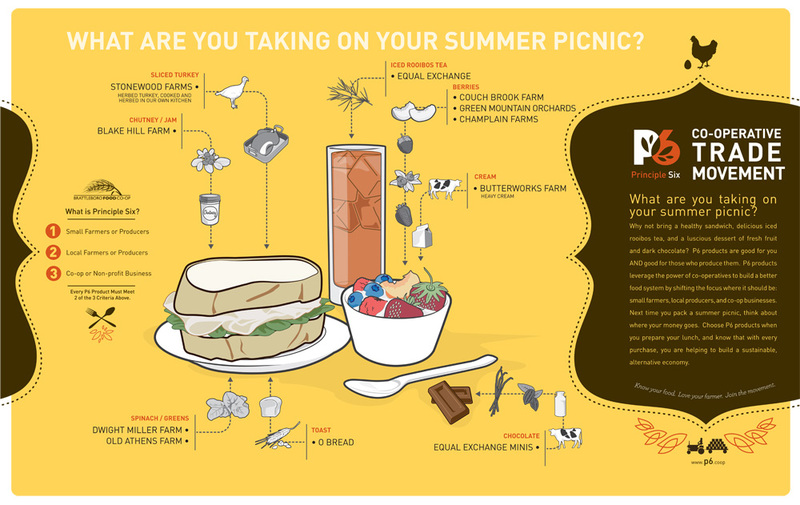 If you live near Seward Grocery Co-op in Minneapolis, MN or Brattleboro Food Co-op in Brattleboro, VT, use these charts to help you plan a scrumptious picnic for these last remaining lazy summer days. Click on the chart to see an enlarged copy and stay tuned for similar charts from other co-ops as well! Know your food. Love your farmer. Join the movement!